Humboldt Roller Derby is composed of four teams! After training camp, all skaters are drafted to one of the two home teams, the North Jetty Bettys or the Widow Makers! Our home teams only play here in Humboldt County! All skaters also have the potential to make a roster for one of our two competitive teams, Root Force and the Redwood Rollers! Our competitive teams skate in home and away games against other teams! It's impossible to list which skaters are on these teams because the rosters have the potential to change with every game! Never having a guaranteed spot on either team means that the skaters work hard to keep their seat on the roster or to take a seat from another player. Skaters must meet certain requirements to qualify for every game, including attendance, health, volunteer duties, and performance. We also have an active junior team, the Redwood Saplings! Also referred to as our “A” team, the Redwood Rollers are the top players in the league and our WFTDA charter team. Being a charter team means that we play in games that are sanctioned by the Women's Flat Track Derby Association (WFTDA) and ranked internationally against other league's charter teams! The Rollers play home and away games and tournaments. 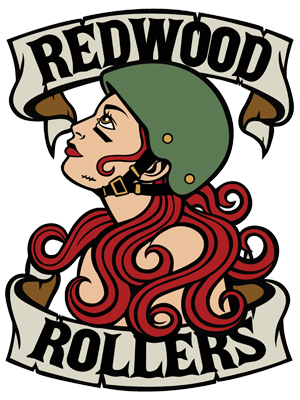 The Redwood Rollers roster is composed of the top skaters from the two home teams, the North Jetty Bettys and the Widow Makers! This is our competitive "B" team! They are the roots that form the Redwood Rollers! This team gives opportunities to skaters from all levels of HRD so they can grow their skills and experience game play against other roller derby leagues! Just like on the Redwood Rollers, Root Force skaters compete against each other for a spot on the roster in every game! Unlike the Redwood Rollers, Root Force games are not played for international rankings with the WFTDA. Rosters are composed of skaters from the two home teams, the North Jetty Bettys and the Widow Makers! The North Jetty Bettys are one of our two home teams! They are anchored here in Humboldt and do not play away games. Every skater is drafted to a home team shorty after they graduate from training camp! Home teams create a sense of belonging but also foster a healthy competitive spirit! The Widow Makers are one of our two home teams! They axe out the competition here in Humboldt and do not play away games. Every skater is drafted to a home team shortly after they graduate from training camp! Home teams create a sense of belonging but also foster a healthy competitive spirit!